Chapter 4 focuses on suffering in the Old Testament. One of the main points that Fretheim brings out in this chapter is that, as a relational God, Fretheim convincingly argues that God will honour the relationship between God and humans at any cost. 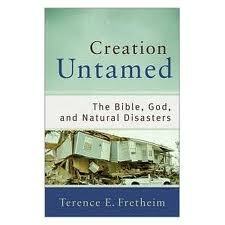 Fretheim admit that this opens God up to charges of neglect, but that “in honoring this basic character of the Creator-creature relationship, God chooses to use constraint and restraint in exercising power in the life of the world.” The main point that Fretheim seems to want to make here is that suffering is a necessary part of living on this earth. This will be difficult to hear for many people ni a society that is deeply committed to the alleviation of pain at any cost. But the message of Fretheim’s book aligns with the life and ministry of Jesus in showing that compassion involves entering into the suffering of others. The fact of life is that love inevitably involves suffering. Further to the above, suffering did not enter the world with sin. Fretheim points out that “human sin can intensify…suffering possibilities, but no necessary relationship exists between human suffering and human sin.” It is unfortunate that this needs to be emphasised, but there has been so much pain caused by statements by Christian leaders over the years about the causes of suffering that the fact that there is no necessary relationship between suffering and sin cannot be stressed enough. Fretheim does an admirable job at stressing this point. As can be seen so far, the points that Fretheim brings out in this book will be quite challenging to many Christians, particularly those in evangelical circles. However, as an evangelical myself, I found myself consistently impressed with Fretheim’s use of Scripture to illustrate his arguments. By choosing to create the world in this way, God’s character is open to defamation and critique. But, as Fretheim points out, this is no different to God’s relationship with the church. Most Christians would readily accept that “God’s work in the church is often associated with the work of agents like ourselves, and God’s reputation suffers because God is thereby associated with an awful lot of, say, incompetence.” God does not choose to intervene when we represent God so poorly, so why should we expect the same to happen in terms of natural disasters?